Hey Jep. I’d say that your diagrams are pretty much spot on in terms of how things *can* be done. Social Media is a superb toolset for *direct* contact/conversation/distribution of whatever the hell content you want. For most orghanisations I’d say it’s an essential part of the marketing mix. Nice one. Keep up the scribbles : ) Love them. I agree that content marketing is certainly presenting new, and perhaps more effective ways for marketers to get their messages out to their target audiences than traditional approaches to PR. However, I would argue that traditional PR still has a place in a company’s overall marketing strategy – it’s just now sitting alongside content marketing, and can often have some overlap. For example, a particular corporate blog post or white paper can be re-purposed as a contributed article in a relevant industry publication. Also, customer quotes from a podcast interview can be incorporated into press materials (press releases, case studies, etc.) – and the multimedia content can also be used to improve a press release’s chances for pick-up. These are just a couple of examples but there are many more. Interesting discussion – thanks for sharing your thoughts. Have you checked out Balsamiq? great succinct article Jep, and love the diagrams. This is the way that advisory services are moving, even here in the Nordic markets. However the tough question is how many PR/advertising firms can make the jump into “editorial” driven marketing. This requires a much deeper appreciation of a client´s marketspace, business model and not least, how to hold the clients hand whilst they learn this new marketing language…..
@ Nancy: great suggestions to reuse social media content for PR! I’d suggest that the red arrow in the ‘today’ sketch should go both ways. I know you’re suggesting reading it from the top down, but good content marketing is two-way while the old broadcast model was one-way. That’s a very interesting diagram, Jep. 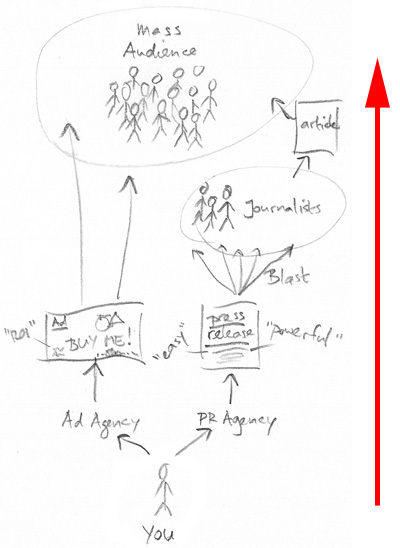 And it does illustrate the change in power from marketer to buyer. 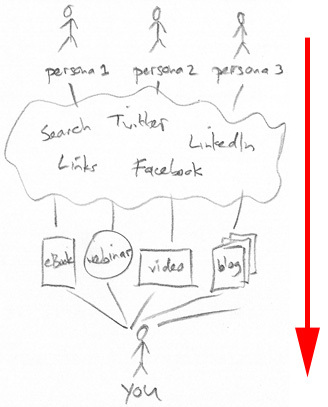 It also illustrates the complexity of content management and the high level of personalization needed. I also agree with the earlier commenter that the bottom diagram should have arrows going both ways. The diagrams are oh-so-right. Have you thought of making a CommonCraft video – you’d be good at giving a no-frills account of the changes happening. @ Doug: that’s a good point. I indeed intended the arrow as the reading direction, but content marketing is indeed more of a continuous feedback loop. @ Jeff: indeed illustrates the power change from marketer to buyer, didn’t think of that yet. “As you get feedback from the prospects, you refine your content in an iterative way.” The tools and processes for this will be key. It takes forever to approve landing pages, emails, datasheets, whitepapers, etc. so I am curious how real-time content tweaking (which I fully support and see as key to demand gen) is achieved. What are the toolsets folks are using to make this happen? Janet, agree that tools and processes are very important to make this work. Although real-time adjustments would be great, I was assuming it would be more evolutionary. If I look at the LeadSloth blog, my topics and writing style have evolved over time, as a response to user feedback. This was step-by-step. Of course, I don’t have to go through lengthy approval processes. Document management, content management and marketing resource management systems can manage approval processes: but that’s not necessarily making it faster, just more reliable. Hope this helps.